I think it's time we try to revitalize this section with a new game, so this time, in the vein of the Remake A Card game, we are going to be taking the plethora of cards that are currently exclusive to the anime and manga, and try to bring them into the current game. 1. You can only suggest a single card, so if there's a series of cards that work well together, you had better hope the thread wants to go in that direction. 2. There are going to be broken cards, and there are going to be cards that aren't worth the cardboard to print them. Your job is to make these at the very least functional and balanced. 3. Do try to keep the spirit of the card intact. Attempt to retain the original stats as much as possible, and keep the effects close, but you are free to make liberties if the effects really do need a workover. 4. Conversely, if there is missing information about a card, feel free to fill it in. A lot of manga cards don't reveal what their Type and Attribute are, or even if they have effects, so go ahead and work on that. You are free to turn cards that were Normal Monsters or non-Effect Monsters in the anime or manga into Effect Monsters. 5. Please provide a link to a wiki page of the card in question when suggesting it as a prompt. That saves everyone a headache. 6. Also, please don't complain about the prompts. Let's kick this off with an oldie, but goldie. Add 1 Level 4 or lower FIRE monster from your Deck to your hand, but it cannot be Normal or Special Summoned this turn. You can only activate one "Bonfire" per turn. If this card is sent from the hand or field to the GY: You can target 1 "Ojama" monster you control and 1 monster your opponent controls; switch control of both monsters. If a monster you control is destroyed by battle or card effect, you can banish this card, then target 1 "Ojama" card in your GY; add it to your hand if it is a Spell/Trap or Special Summon it if it is a monster. Send 1 Effect monster from your hand or field to the GY to activate this card. Once per turn, you can discard 1 monster to activate that monster's effect as this card's effect. FLIP: Banish 1 card at random from your opponent's hand. If this card is destroyed by battle or your opponent's card effect: You can Special Summon 1 "Ashingray" from your hand or Deck in face-down Defense Position. If you take battle damage while this card is in your Graveyard: You can Special Summon this card from your Graveyard in face-down Defense Position, but if this card is Summoned this way, banish it when it leaves the field. Definitely a gimmicky rogue strategy card, but actually playable now. You can activate this card from your hand if you control a "B.E.S." monster or a "Big Core". During your Main Phase: You can activate 1 face-down Continuous Spell/Trap you control. Your opponent cannot activate cards or effects in response to this effect's activation. If a "B.E.S." monster or a "Big Core" you control is targeted for an attack: You can negate the attack, and if you do, end the Battle Phase. You can only activate each effect of "Alert" once per turn. Honestly, B.E.S. Support seems the way to go. If a Spell Card or the effect of a Normal, Quick-Play, or Continuous Spell Card is activated, place 1 Spell Counter on this card. If a Spell Card is added to your hand: You can discard the added card; place 1 Spell Counter on this card. The equipped monster gains 100 ATK for each Spell Counter on this card. If this card and/or the equipped monster would be destroyed or banished from the field, you can remove 2 Spell Counters from this card instead. If the equipped monster destroys your opponent's monster by battle: You can add 1 Normal Spell Card from your Graveyard to your hand. And it's still probably kinda bad. If your opponent controls a monster and you control no monsters, you can Special Summon this card from your hand. If this card is used as a Synchro Material, you can activate this effect: until the end of your opponent's turn, neither player can use monster effects except the effects of Synchro Monsters, also non-Synchro Monsters cannot declare an attack. ●Add 1 Normal Spell Card from your Graveyard to your hand, except "Altar of Restoration". ●Add 1 monster from your Graveyard to your hand that cannot be Normal Summoned/Set (the selected card must be added to your hand, and cannot be returned to the Extra Deck). You can only activate 1 "Altar of Restoration" per turn. Add 1 "Dual Gates" from your Deck or among your banished cards to your hand. You can banish this card from your GY and 1 "Dual Gate" from your hand; draw 2 cards, also for the rest of this turn, you cannot draw cards with card effects. You can only use each effect of "Dual Gates" once per turn. 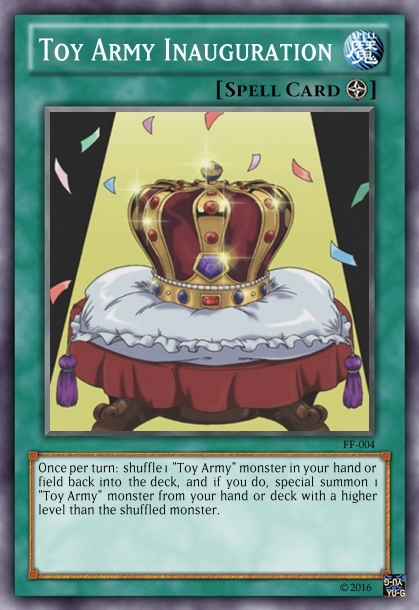 If this card is Normal or Special Summoned: You can add 1 "Fife and Drum Corps" or "Crowning of the Emperor" from your Deck or Graveyard to your hand. This card can attack your opponent directly. During the Standby Phase, if this card is in face-up Attack Position: You can change this card to Defense Position, then Special Summon 1 "Toy Soldier" from your hand or Deck, and the Summoned monster cannot be destroyed by battle or card effects this turn. It's a Machine Dupe target now, it carries the direct attacking that "Forced March" gave it in the anime, and searches the boss monster of its anime user's Deck. This almost feels like anime legacy support. ... You did miss them. Four of them actually, where you presumably had to pick just one. Those weren’t his. Those were taken from the Wiki, with no changes to them. He simply didn’t want you to waste your time going through the Wiki so you can know what cards you need to change to legalize. Cannot be activated if you have already activated a card or effect this turn. For the rest of the turn after this card is activated, even if it or its activation is negated, your opponent takes no damage from card effects, also you can only Special Summon once this turn. Draw 3 cards, then send a number of cards from the top of your Deck to the Graveyard equal to the number of cards in your hand. Then, your opponent draws 1 card. If your LP are 1000 or less during your opponent's Main Phase, you can banish this card from your Graveyard: Draw 1 card (you can only activate this effect of this card's name once per turn). ●You have to start your turn with it, so no shenanigans with dodging its restrictions, and it comes packaged with a once per turn clause harder than diamond. ●You are completely unable to inflict burn damage, and you only get 1 Special Summon; no burn FTKs or Extra Links, but you can Exodia with it if you really have no shame, and if you're going second, you can OTK through sheer damage if that's your style. ●Mills equal to the number of cards in your hand as opposed to your entire goddamned Deck for reasons that should be obvious. ●Your opponent immediately gets a draw, so they can potentially grab their Ash to discourage the shameless from going off. ●Did you just barely survive your opponent's turn? Have a draw. Over-restricted? Perhaps. But Card of Demise had similar military-grade restrictions, and that thing defined stun Decks for a while, so . . . When a monster(s) is Special Summoned by a "Rank-Up-Magic" card: You can discard 1 card; draw 2 cards. If a monster Special Summoned by the effect of a "Rank-Up-Magic" card attacks, your opponent cannot activate cards or effects until the end of the Battle Phase. You can only control 1 "Rank-Up Advantage". I'm not sure if I made it better or worst, but I definitely made it into something more "legal" IMO. I suppose you could say it's debatable. - Changed it from an "If" mandatory effect to a "When/You can" optional effect. That way, if the summoned monster activates something on summon; it misses timing. - Removed draw 1 for each summoned monster and gave it a fixed draw 2 cards effect with a discard 1 cost. Before the number of cards you draw could vary, depending on what kind of RUM card you used. Now it draws a set amount of cards instead, which may or may not be more powerful. - I kept the second effect somewhat the same, except now it stops the opponent from activating anything for the rest of the BP, not just the damage step. - And lastly, I gave it a restriction that only allows you to have one copy out at a time, preventing abuse of it by using multiples. Again, this could be called both a buff and a nerf in many ways. I mean, the way I see it, this is how a real version of it would be like. But, who knows, from what I hear KONAMI releases them anime/manga cards in all sorts of different ways, buff'd, nerf'd and sometimes even intact! When this card is Normal Summoned: Draw 1 card, reveal it, and if it is "Ipiria", you can Normal Summon that card from your hand immediately after this effect resolves. During the End Phase, if you have 3 "Ipiria" in your GY, you can: immediately after this effect resolves, shuffle all 3 "Ipiria" into your Deck. Lore: If a Level 4 or lower Zombie monster with 1200 or more DEF is sent from the field to your GY: You can send 1 monster with the same name as that monster from your Deck to your GY, and if you do, Special Summon 1 "Infernal Token" (DARK/Zombie) with the same original Level/ATK/DEF as that sent monster's, and if you do, all Zombie monsters you control gain 500 ATK. During Main Phase 1: The turn player can discard 1 Zombie monster; destroy all monsters on the field, but the turn player can only Summon 1 Zombie monster face-up for the rest of the turn. You can only use each effect of "Infernalvania" once per turn. Mimics Zombie Werewolf and Vampire Bat's spawning effects, and that destruction effect does allow you to Summon...but only one Zombie. Good luck with it, folks. Offhand, Rank-Up Advantage didn't need a sidegrade, or even a direct pull . . . that card is absolutely awful in the anime. If an opponent's Spell Card is sent from the field to the Graveyard: Add that sent card to your hand. If this effect resolves, your opponent draws 1 card during the End Phase. If this card was activated on the field, your opponent's monster effects cannot be activated in the same Chain as this card. Once per turn, if you control no face-up cards: You can activate this card from your hand. Fixed a bit of awkward wording, and took away the ability for it to trigger off of discards/mills. However, the draw has been moved to the End Phase, it carries monster effect shielding during the Chain it gets used on the field, and the option of being a handtrap.